Stone brews so many different beers each year that sometimes it is better to review two at once. 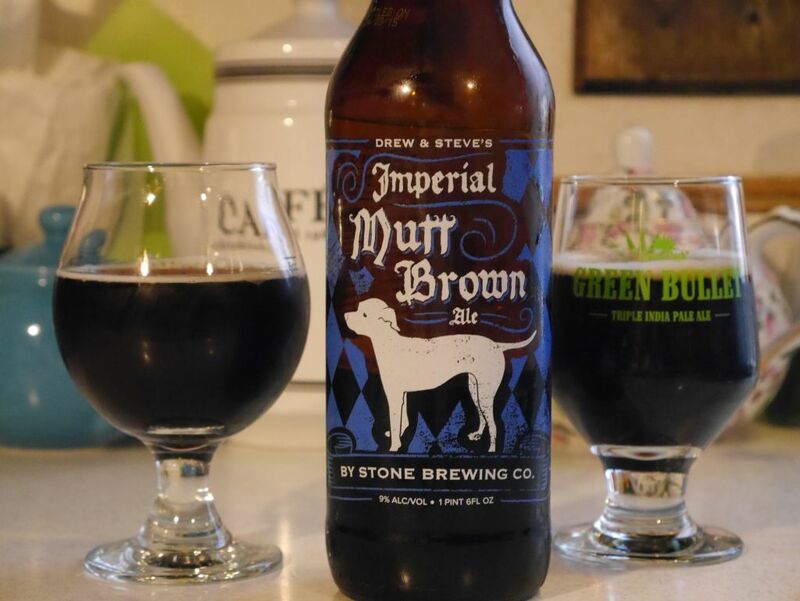 This time I happened to find the new Imperial Mutt Brown in the store at the same time as the 2015 Odd Year Chai Spiced Imperial Russian Stout so I thought I would review them together. Since I hadn’t tried any sort of imperial brown ale before I was interested to see what I would find. Though I really enjoyed the bottle design I was pretty let down by the overall flavors presented. Overall I found it to be heavily boozy and not presenting a lot of roasty flavors. While it pours thick it doesn’t have any of the flavors of an imperial stout. Many of the mellow flavors that you get in a brown ale are still present here though slightly stronger. Overall it doesn’t have the strong amount of flavor that should be expected from a 9% beer. It does have a small amount of chocolate flavor that is revealed when it warms up. While I know this is not an imperial stout, the alcohol content and price are such that I think it is a fair point of comparison. 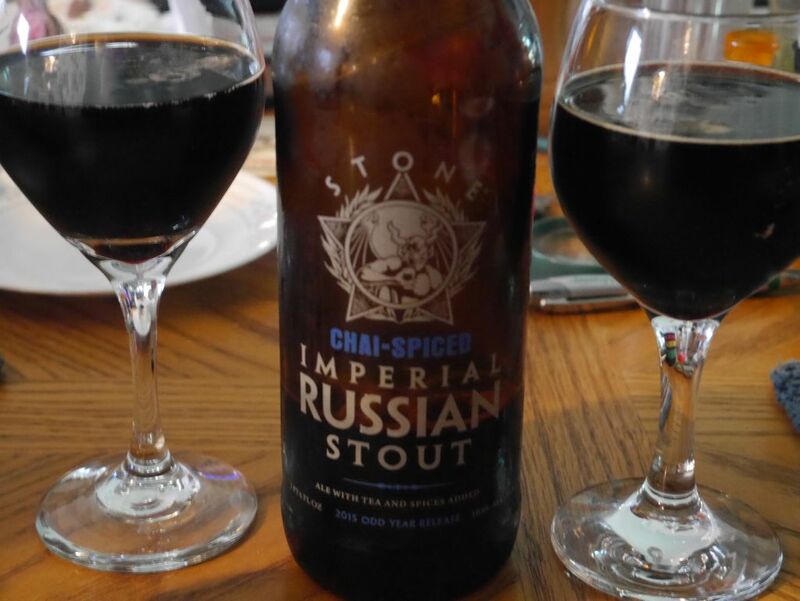 Next came the Chai Imperial Russian Stout. At first I was hesitant to give this a try but I heard good things so I picked up a bottle. Spices are good and mellow balancing nicely with the imperial stout flavors that are always enjoyable. I was very unsure if I would enjoy this but it really makes a great stout and stands out among the crowd. The tea flavors are mostly overpowered by the spices so I didn’t notice them very much here. This is a nice mellow beer that packs enough flavor to go up against the classic Stone Imperial Russian Stout. 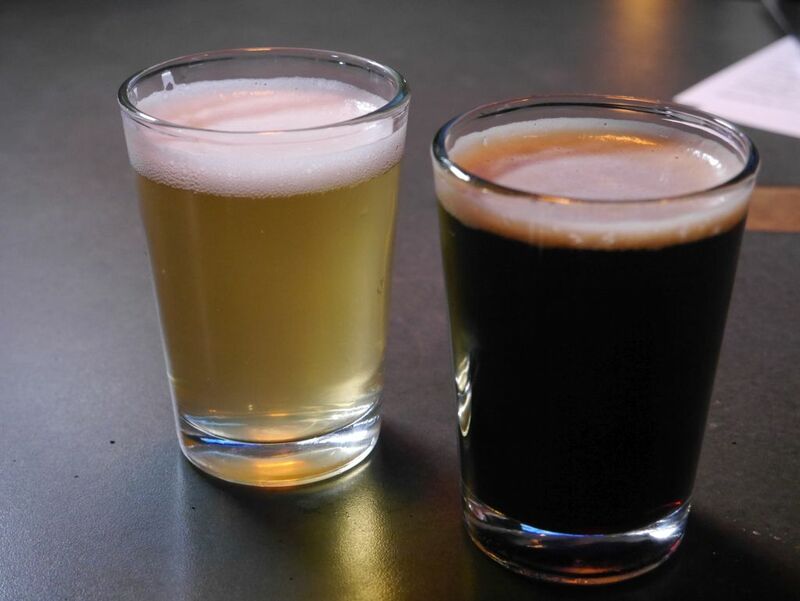 If you have a choice between the two beers above, I would absolutely go with the Chai Stout over the Imperial Mutt Brown. If you had a different experience with the Mutt Brown I would love to hear about it in the comments. 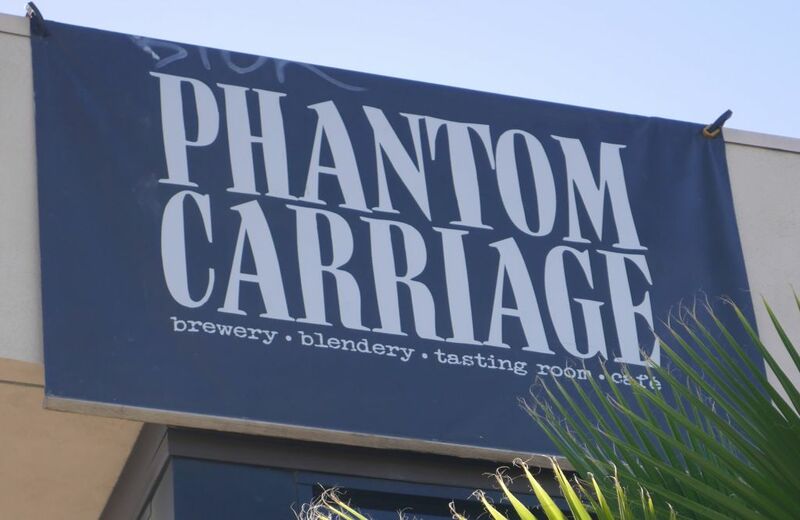 My third and final Torrance area brewery during my recent visit was Phantom Carriage. Phantom Carriage is located in Carson, slightly between Torrance and Long Beach but close enough to Torrance area to make it a natural next stop for the day. It just so happened that they were celebrating their grand opening that day so how could I not stop in!? After getting my IPA fix at Smog City and my Belgian fix at Monkish I was ready for some sours. 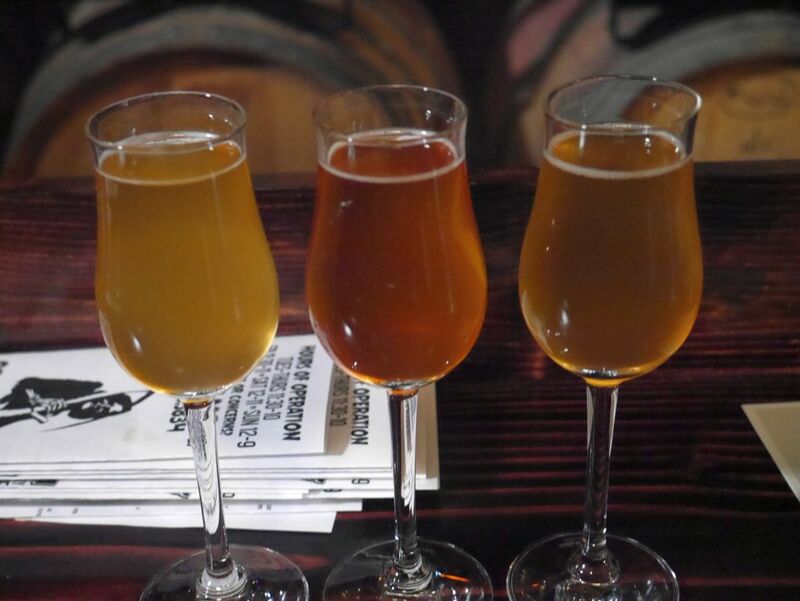 Many Southern California breweries that make sours focus on fruit sours (beer with fruit added) but Phantom Carriage had wild ales and sours on tap, in the form of both dark and light varieties. I started with a flight of the Muis wild ale (a sort of brett blonde ale), Old Muis aged wild ale, and Bergman sour ale. The Muis was a solid beer with plenty of tropical fruit and light hoppy flavor with a mild amount of tart flavors. The beer was overall quite enjoyable. The Old Muis, which was an aged version was quite a lot more tart and had a light flavor of bourbon or whiskey. The Bergman was very light and not very sour or tart and had a light fruit flavor and light sweetness. Compared to the others it didn’t taste like much. Subtle beers are hard to enjoy when others are such knockouts. As you can see in the pictures below, Phantom Carriage uses a unique style of taster glass that gives you a good chance to enjoy the aromas of the beers. Second flight I tasted the Rathrbone dark sour, Lugosi barrel aged sour, and Dolores dark farmhouse ale. The Rathbone was a flavorful beer that was much more tart than the Bergman with plenty of good dark fruit flavors and a nice overall tartness. The Lugosi was quite tart and that did a good job to balance out the flavors of the barrel that gave it a nice boozy flavor. The dolores was quite smoky and had plenty of roasted malt flavors and a little bit of dark fruit. Though on its own it had a strong smoke flavor it was great when compared to the others. 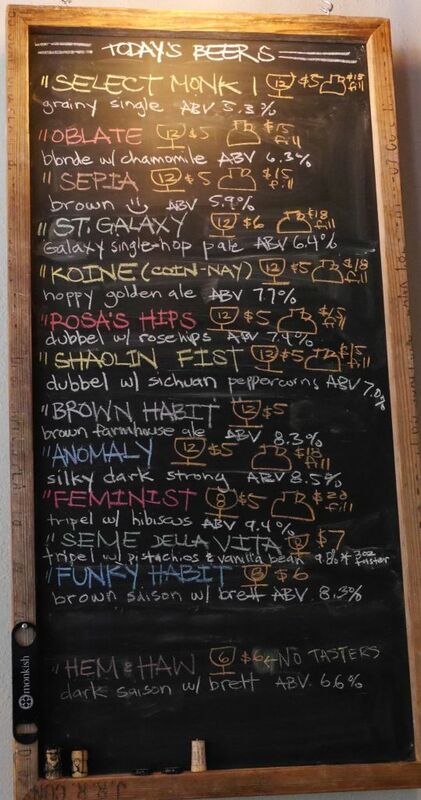 Tap list on the grand opening day. Overall, I was quite impressed by the beers at Phantom Carriage to start and look forward to what they will do in the future. Their tasting room is fairly large with enough room to handle a good number of people. They also have some food they serve as well, a rarity for new breweries. If you live in the area and like horror movies they also have a small theater where they will be playing horror movie classics. I couldn’t tell if this is going to be something they do all the time or only certain scheduled events. I will certainly be stopping in the next time I am in the area to see how things are progressing. Monkish was my second stop in the Torrance area. After visiting Smog City I felt a craving for something different. I quite enjoyed the Belgian style beers at Monkish that offered plenty of heavy carbonation as comes with the styles. Rather than giving you all four beers in the flight at the same time, Monkish gives you a glass and some tokens so that you give them a new token each time you are ready for the next beer. This way people can enjoy the beers in a proper glass and focus on them one at a time. In the flight I tasted the Sepia Belgian brown, Brown Habit brown farmhouse, Anomaly dark Belgian and Funky Habit brown saison with brett. I returned the next day and had a taste of the Hem & Haw wild ale also with brett. From the first sip of the Sepia I was hooked. It had plenty of delicious Belgian spice mixed nicely with the roasted malts flavors and a little bit of bitter chocolate. After the Sepia I went for the Brown Habit which was poured from a bottle. It had a very smooth finish and a nice dark fruit flavor that mixed nicely with a little bit of caramel flavor. Adding in the mild sweetness I thought this was perfectly balanced. I ended up taking home a growler of the Sepia and two bottles of the Brown Habit when I stopped by the next day on my way home. Tap list when I visited. The Anomaly dark Belgian had a nice dark fruit flavor with a light coffee flavor. The heavy spice and carbonation were good but it did not live up to the other beers in the list. I ended with the Funky Habit, a brett version of a brown saison. It had a nice flavor of stone fruit and a light amount of tartness. This was also quite good. I would have liked to have tried more beers while at Monkish but with one more brewery to go for the day I didn’t want to overdo it. I did have a taste of the Hem & Haw dark saison with brett yeast when I returned for some bottles on my way home. It had an interesting light smoke that combined with some roasted malts and dark fruits. However, the beer was quite light in body and didn’t have the full flavor that I got from the other beers I tried the previous day. 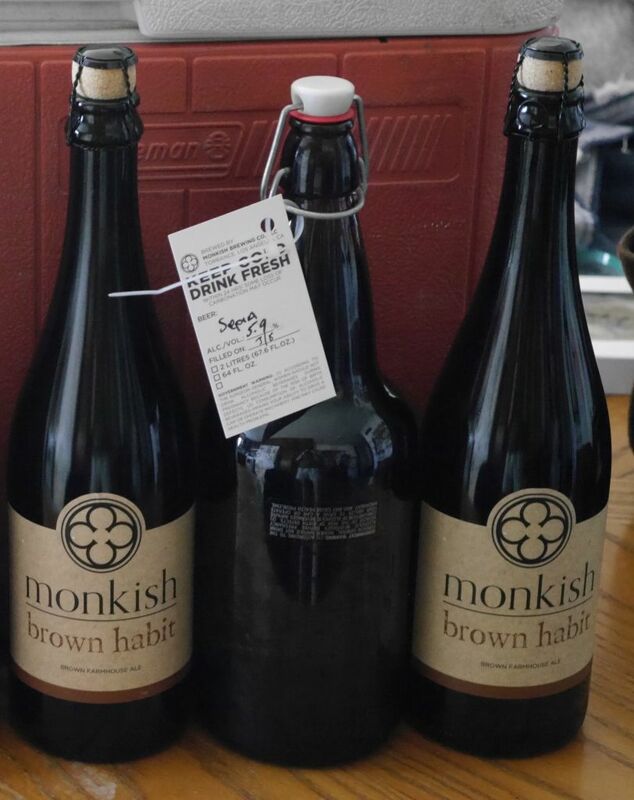 In all I was very impressed by the beers I was able to taste at Monkish especially the Sepia and Brown Habit. I hope to return the next time I am in the area to have a taste of some of their other many offerings. Monkish has a very nice tasting room with plenty of places to sit. This was the first time I encountered sacks of grain used as chairs. 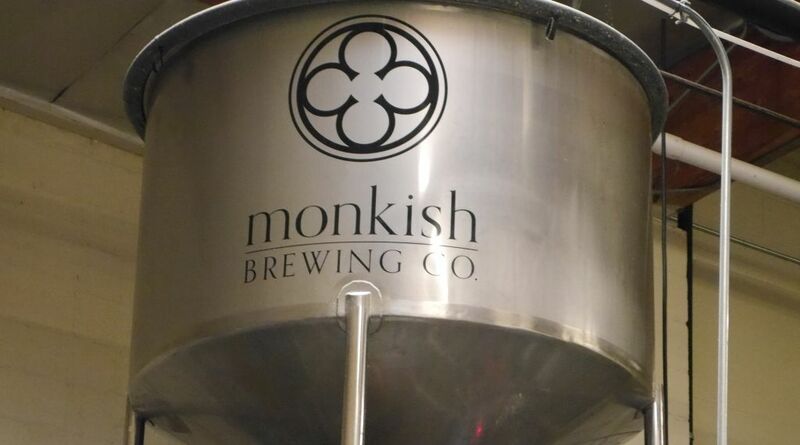 Monkish is close enough to Smog City that you can easily walk between the two. 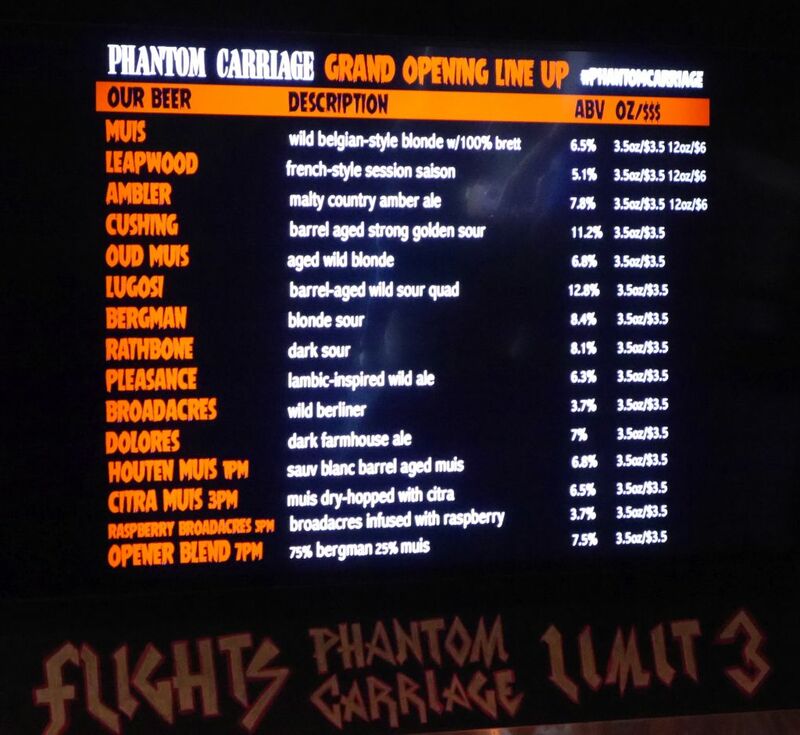 Check back next week for my coverage of the grand opening of Phantom Carriage featuring some delicious dark sours. 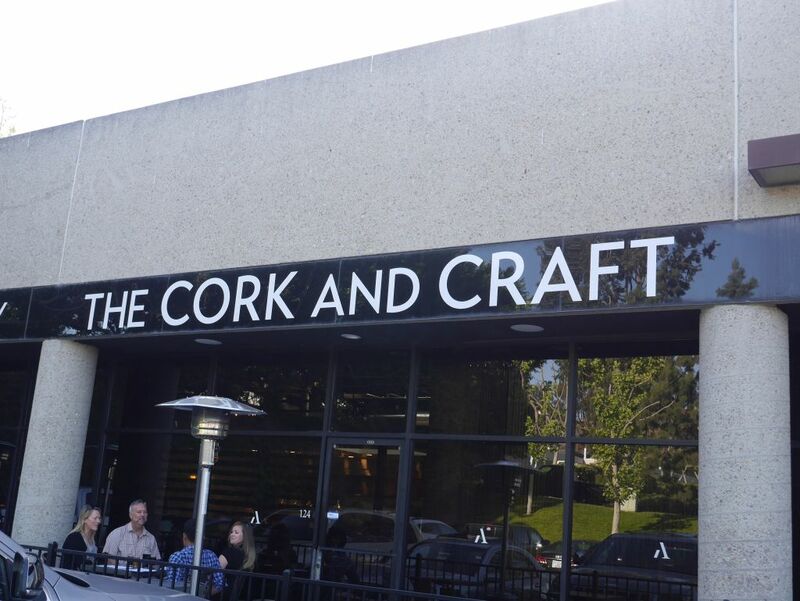 The Cork and Craft opened sometime last year offering a wide tap selection, good wine selection, and a menu of upscale food. 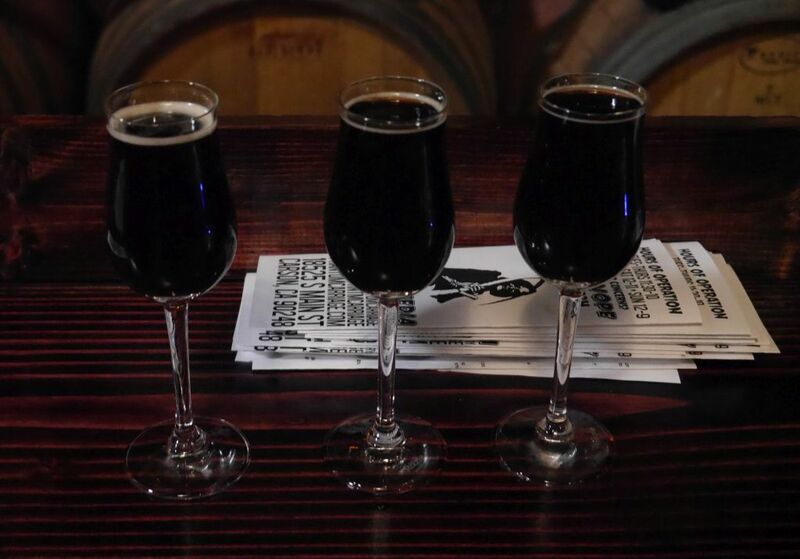 They already hosted quite a few events including one featuring Stone’s Xocoveca Mexican Chocolate Stout where you could meet the Tijuana brewers who worked with Stone. 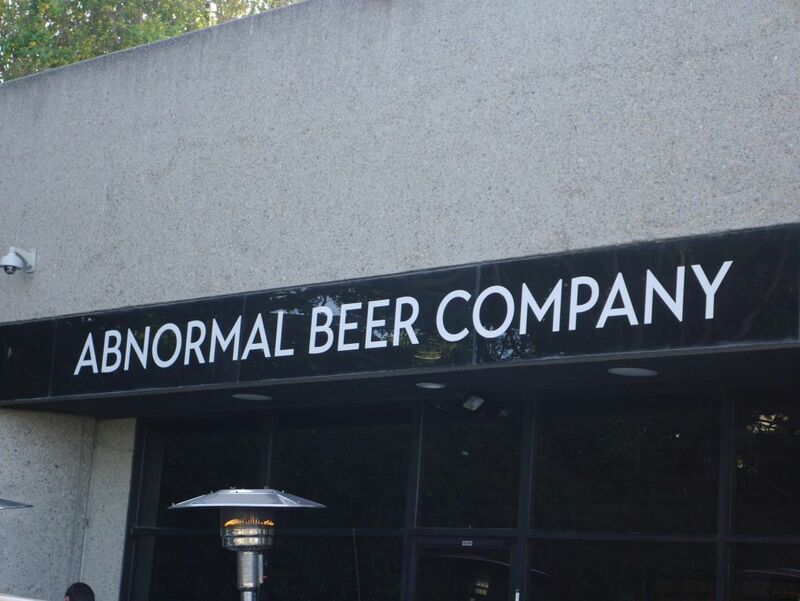 On April 7, 2015 they had the official opening of their house brewery known as Abnormal Beer Company. This meant the first set of house beers was available on tap. I came up to see what they were brewing and tried the session IPA, mocha stout, IPA, and cask mocha stout with honey. The Session IPA was crisp and lightly bitter, in line with the other San Diego session beers. Some hop heads might find it too low on bitterness compared with a Stone Go To IPA. Comparatively the IPA was a powerful 7.6% while not much more bitter than the typical pale ale. The IPA was a little sticky and packed in some delicious tropical fruit, lemon and orange flavors and was mild enough that people who are scared away from IPAs might enjoy it. Selection of house beers available. Session IPA and Mocha Stout. 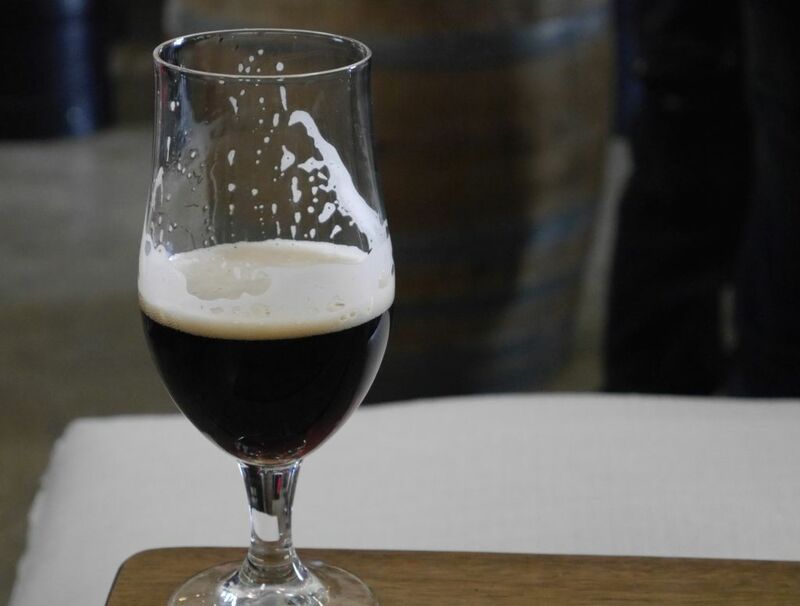 The Mocha Stout was a very flavorful stout for just over 5% alcohol, blending nicely a strong coffee flavor with chocolate and signature roasted malt flavors. This certainly gives the Black House from Modern Times a run for its money. Compared to the regular, the cask stout was a bit too mild for me, mostly because of the addition of the honey. An already smooth beer from the cask became a little too mellow with the honey although you could still taste a little bit of the coffee. 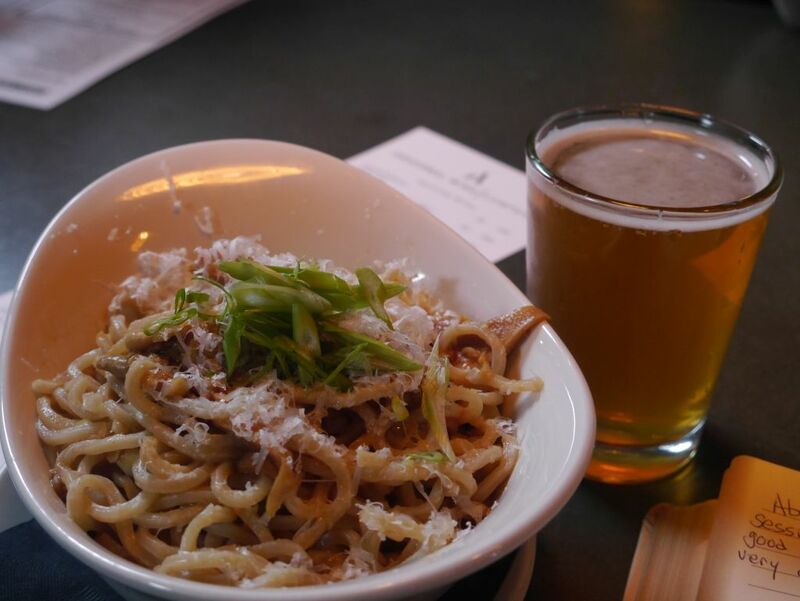 IPA with happy hour garlic noodles. Though I would have liked to have been able to order tasters of the house beers, I got a good taste with the 8 ounce pours of each. 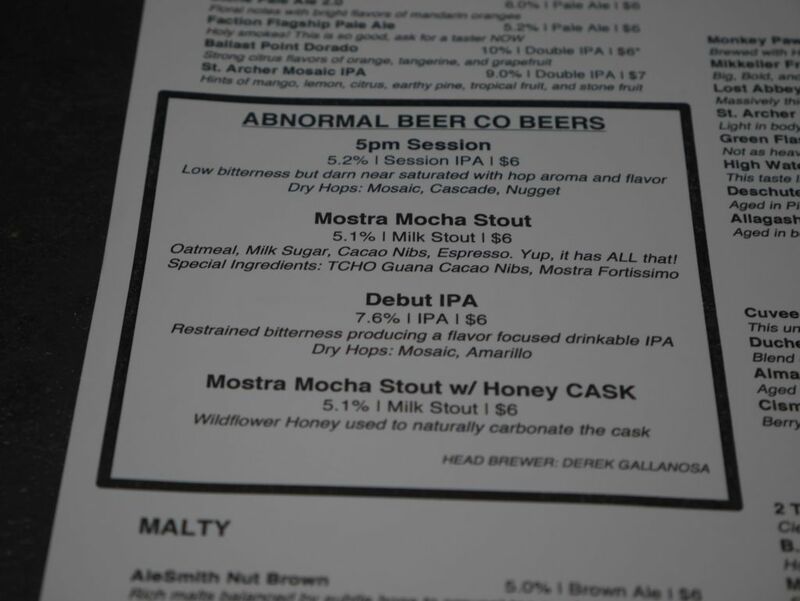 Both the IPA and Mocha Stout would be worth ordering a pint if you are interested in their house beers and fans of the styles. When I am in need of a place for a pint in the area I will certainly be coming back after seeing the wide variety of beers available on tap. For those in the area looking for a good location to have a pint after work Cork and Craft has something on tap for everyone, even your friends who only drink wine. 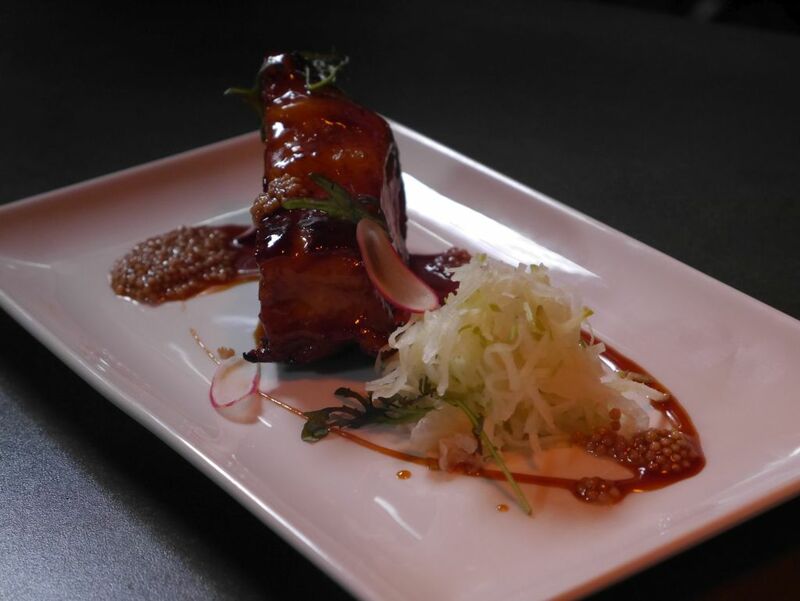 Pork belly dish I shared with my neighbors. Before I left I got a chat with the brewer who mentioned that they will be planning some multi-course beer dinners going forward where big breweries from all over will get a chance to pair beers with their chef’s creations. This will also give them a chance to put one of their house brews in the lineup to get people to try them. Smog City was the first stop in the Torrance area where I planned to visit a few breweries on a Saturday. 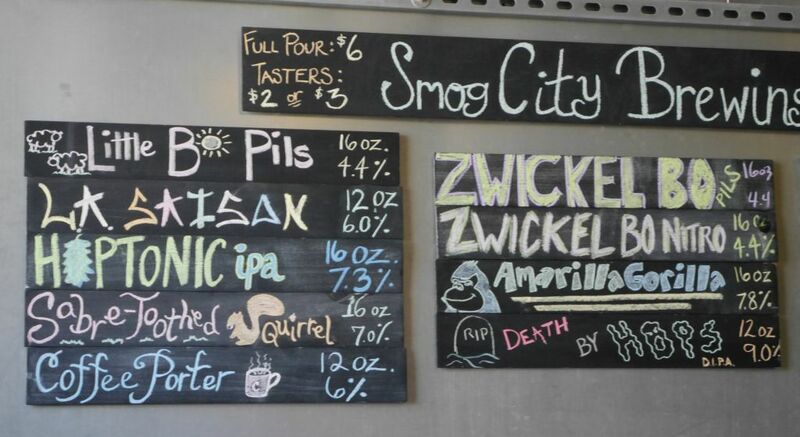 One of the breweries I had heard the most about before visiting was Smog City. I stopped by the tasting room as the first stop for my day and found them to have plenty of good hoppy beers and a fantastic porter. I started with a flight of the saison, coffee porter, sabetooth squirrel hoppy amber, and hoptonic IPA. The saison was a nice beer with a good citrus flavor and a very light tartness. Next came the coffee porter which I found to be quite intense as someone who hasn’t had a cup of coffee for three weeks. It had a very intense coffee flavor and wasn’t overly bitter. The Saber Tooth Squirel was an interesting beer that I found overly bitter with not enough flavor. Though it had a powerful floral hop flavor it was mostly a malt bomb and heavily bitter. I did not finish this taster. The Hoptonic IPA was a solid IPA with a light tartness and a solid bitterness and flavors reminding me of under ripe mango and lemon. Finally I tasted the Death By Hops Double IPA. It had a strong citrus flavor with lots of lemon. It was almost as bitter as the squirel and had a nice balance. Overall I thought the IPAs were solid but didn’t present the sort of hop profile that I enjoy. The porter was as good as everyone said and Smog City could easily rest on the quality of the porter. If you are looking for a good alternative to the typical west coast style of IPA you might enjoy the flavors in the Smog City IPAs. 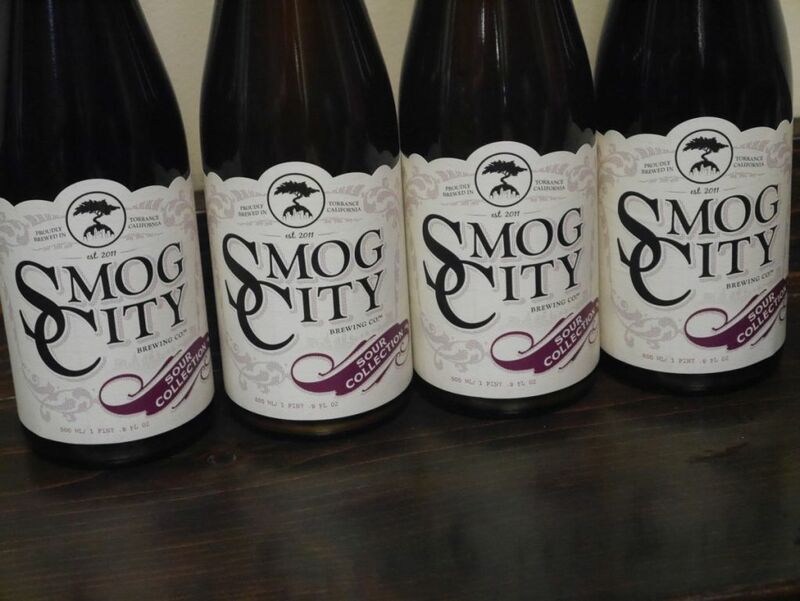 Smog City has bottles available for purchase at the tasting room of the Saber Tooth Squirel, and coffee porter. 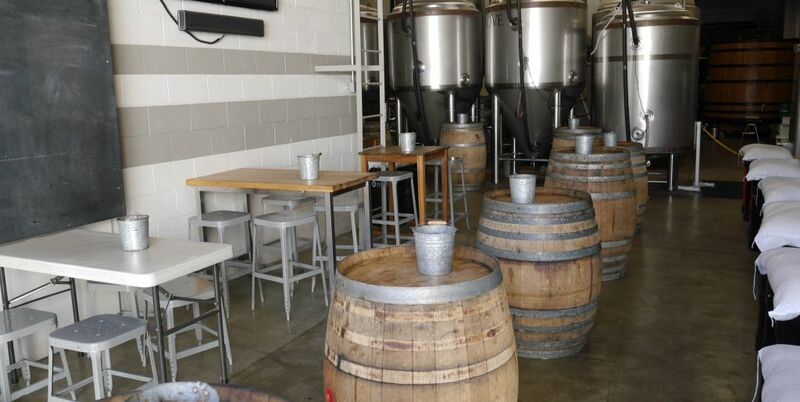 The tasting room offers tables with places to sit and enjoy your beers slowly. 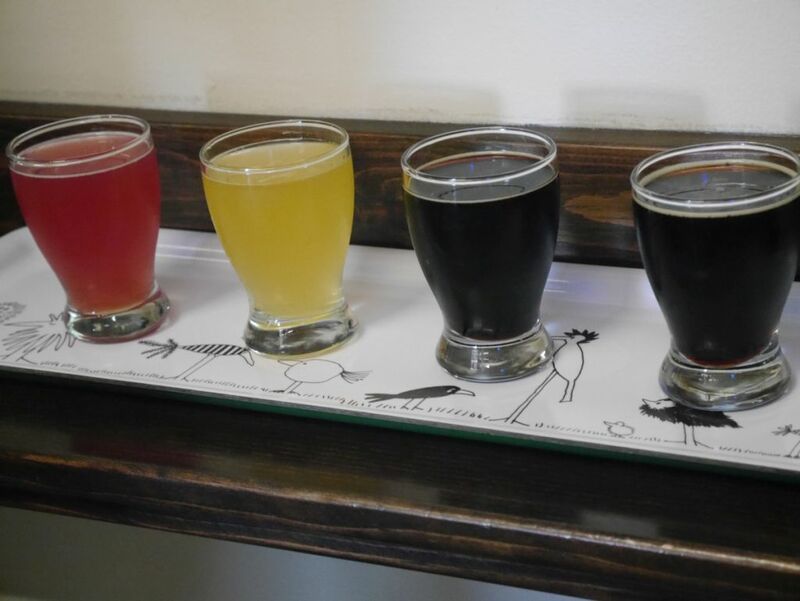 I’m always open to changing my mind about a brewery over time and with Smog City all it took was speaking with a number of beer geeks who indicated that Smog City makes awesome sours and barrel aged stouts. Neither of these was available the previous time I visited but I happened to catch an online bottle sale of the Snugglebug and Cuddlebug sours and so when I stopped by to pick them up I also got to taste their Infinite Wishes barrel aged imperial stout. My bottles of the sours I picked up. Tasters of the sours and a few stouts. I was quite impressed by both of the sours. The Cuddlebug has peaches and apricots and had a really nice crisp dry finish with a mild amount of tart and some citrus notes. The Snugglebug has raspberry and boysenberry and had an overall smooth delicious fruit taste with a mild amount of tartness. I would compare these most closely to the Beatitude beers from Council Brewing but with the underlying beer coming through a little more. Infinite Wishes was quite tasty as well, with plenty of vanilla and bourbon coming through in the super smooth imperial stout. I’m glad to say that I will likely be picking up more Smog City sours in the future.